9 de marzo de 2017 | Fotogalerías | Derechos humanos | Género | ¡Berta vive! Tens of thousands of women marched this March 8th down the main avenue of Montevideo, capital city of Uruguay, in the context of a strike called by the trade union center Pit Cnt, joining the mobilizations that took place in at least 50 cities around the globe. In the case of this South American country, with a total of nine victims of feminicide in 2017 so far, the historic demonstration had a very special meaning. This was based on a demand for the passing of a comprehensive law to eliminate gender violence and to incorporate the crime of feminicide into the Code of Criminal Procedure. In addition, recent studies shed light to the inequality gap between men and women, both with reference to their income -for the same positions- and to the unpaid work hours. The crowd started to gather in the afternoon, and it covered eight blocks. Some estimations suggest that 300,000 people participated in the march, which would make it the largest mobilization in decades in Uruguay. Men also participated, although to a lesser degree than women. And women, without a question, were the loudest voices present at the mobilization, some of them part of the feminist groups that together with unions, human rights and environmental organizations were in charge of organizing the march. 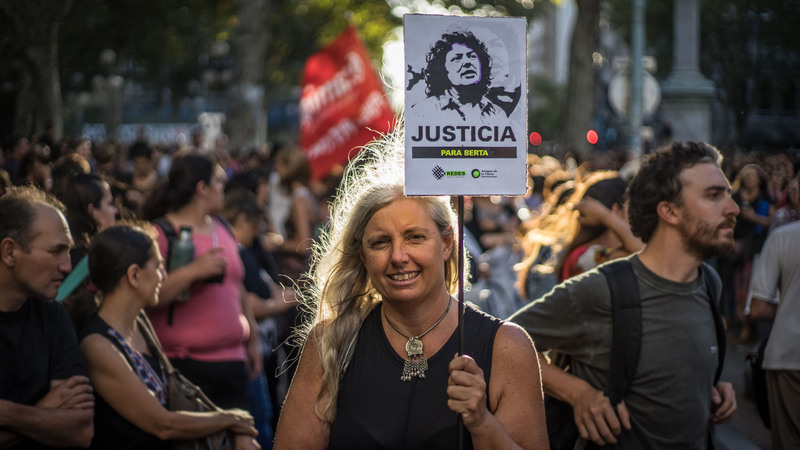 Members of Redes - Friends of the Earth Uruguay marched with images of Honduran activist Berta Cáceres, who was murdered in Intibucá a year ago. During the mobilization there were artistic performances, including by the percussion group La Melaza. Several authorities also participated in the march, including Education and Culture Minister, María Julia Muñoz, Montevideo´s Mayor, Daniel Martínez, former president José Mujica and the Dean of the University of the Republic.